Choosing the correct syringe size depends on two factors: the material pot life and the amount of material needed. A material with a 12-hour pot life gives you more options than a material with < 1 hour of pot life. Knowing the amount of material needed is important because of waste: you don’t want 5cc of material if you can only apply 1cc within 30 minutes of pot life. How you’ll apply the material is also important – e.g. robotically versus manually. If using a robotic application, you’ll need to determine material needed per application plus the number of applications per minute. Note that the fill of the syringe is approximately 20% more than needed. The added quantity is for yield and setting up the dispenser. It’s always better to have a little left over than come up short on a run. If you’re applying the material manually, determine how much you need for your application and how many “fills” you can do per minute within the material pot life. Then determine syringe size. Which size is easiest to use? Syringes come in standard sizes, from the smallest at 1cc, to the largest at 55cc. The most popular size Appli-Tec provides is the 3cc syringe. Due to its size and shape — it feels like a pen when you hold it — a 3cc syringe makes it easier to manually place “dots” or fill cavities in intricate parts with a certain level of precision and accuracy, as you can see in the photo at the top. Appli-Tec offers precision mixed and frozen adhesives, tailored to your exacting requirements, and packaged to suit your application — whether robotic or manual. 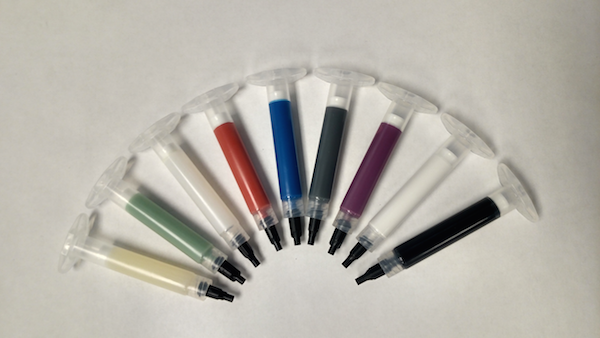 We also offer non-reacted adhesives packaged in multi-component pouches and cartridges, and large-volume containers. Whichever format you choose, all our adhesive products are GHS compliant.